Winter is here and that means we’re eating a lot of soup. There’s just nothing better than coming home to a nice warm pot of soup. Just whip up some biscuits to go with it, make some toast, or dust of the bread maker and start some bread when you’re starting the soup in your crockpot. 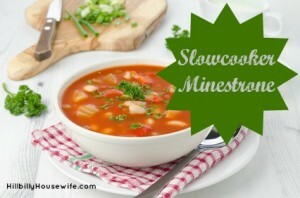 Below you’ll find 10 of my favorite Slowcooker soup recipes. These make a regular appearance on my weekly meal plan. 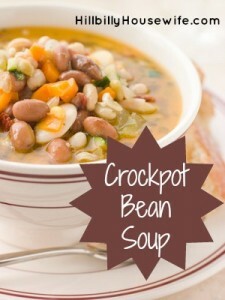 Not only are soups absolutely delicious, they are also quite frugal and by using your crockpot you don’t have to worry about stirring pots all day. 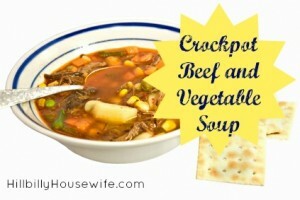 Put all ingredients into your crockpot and cook on LOW for 8 hours. Stir all but milk, flour and butter into crockpot. Cook on low for 6-8 hours, check tenderness of potatoes. 20 minutes before serving, melt butter in a saucepan, add flour and gradually add milk, stirring constantly over med heat until thick. Stir mixture into crockpot. Let cook 15-20 minutes more. Combine all ingredients except macaroni and Parmesan cheese in the stoneware. Cover cook on Low 8 to 9 hours or on High 4 to 5 hours. Stir in macaroni. Serve sprinkled with cheese. I substitute 1-1/2 t. Italian seasoning for the basil and oregano. Peel and cut your potatoes into small chunks. Chop the onion and garlic. 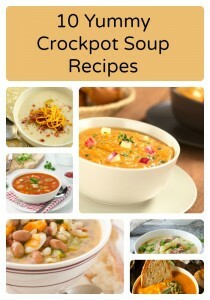 Put your chopped veggies, chicken broth, butter, salt and pepper into the crockpot. Cover and cook on HIGH for 4 hours or LOW for 8 hours . Mash mixture with a potato masher until potatoes are coarsely chopped and soupy is slightly thickened. Stir in cream, cheese and chives. 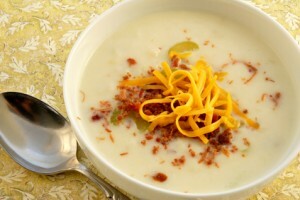 Ladle the soup into bowls and top each with sour cream, bacon and a little extra cheese. 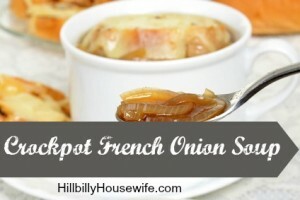 In slow cooker, combine onions and butter, broth, Worcestershire and salt. Cover and cook on HIGH 4-6 hours. 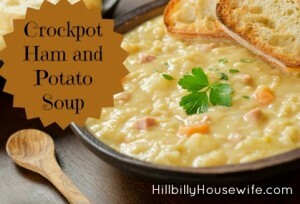 Pour hot soup into bowls and top w/ bread and sprinkle w/ cheese. Pour ingredients into 6 qt. slow cooker and stir well. Cover and cook on low 8-10 hours. Serve w/ cheese toast or grilled cheese sandwiches. Brown beef in skillet w/ onion. Drain fat and add to crockpot. Add all other ingredients (do not drain cans), and stir to mix. Cover and cook on low 8 hours or HIGH 4. 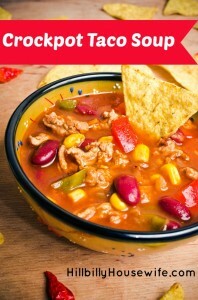 I usually add more water and a little more bulk taco seasoning powder to make it more soupy. Cut your turkey (from leftover roasted turkey) into bite-size chunks. Chop the onion, carrot and celery. 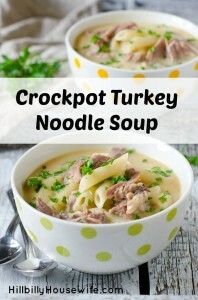 Place everything except noodles in your crockpot and cook on low for 4 hours. Remove the bay leaf and add the noodles. Cook another hour on low or 1/2 hour on high until the noodles are soft. Serve the soup hot. Melt margarine in 10-inch skillet over medium heat. Cook onion in margarine, stirring occasionally, until crisp-tender. 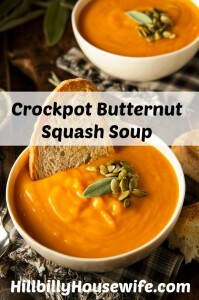 Mix onion and remaining ingredients, except cream cheese, in 3 1/2 to 4 quart slow cooker, Cover and cook on low heat setting 6 to 8 hours or until squash is tender. 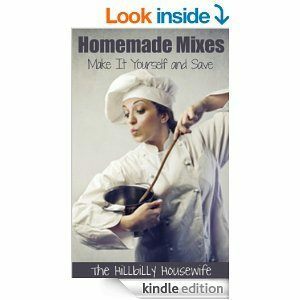 Place one-third to one-half of the mixture at a time in blender or food processor. Cover and blend on high speed until smooth. Return mixture to slow cooker; stir in cream cheese. Cover and cook on low heat setting about 30 minutes or until cheese is melted, stirring until smooth.